141-WH-DST is rated 3.9 out of 5 by 17. Rated 3 out of 5 by toby from awkward installation I have been installing faucets for over 40 years. I found the long supply tubes extremely awkward to work around. The four plastic pipes were so close together that trying to tighten the bolt to anchor the unit to the countertop was almost impossible. Things had to be aligned perfectly or they fell apart. The faucet kept falling over and dislodging the alignment. Took way longer than it should have to install. 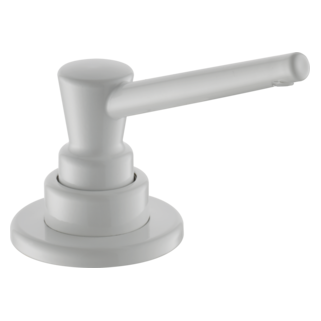 Rated 3 out of 5 by Elaine from Elaine of Brooklyn NY The faucet was very nice , the only thing is that i had a three hold sink, i just assume it would include the plate to cover the holds! I guess that was my error, but overall itvwas ok!! Rated 3 out of 5 by Barrycuda from Delta Faucet k Since this went into a rental & I haven’t heard anything from the new tenant, I assume it’s working without a hitch..I do wish I had saved the installation instructions though. I have a Delta 9113-AR-DST that I purchased from your & opening the box, discovered no paperwork whatsoever. Seems like all parts are there but without instructions I’m not certain. Quartz countertop arrival in about a week. Rated 4 out of 5 by Chas from The Good, the Bad, the Ugly. Great look of a faucet. Works well. The band was trying to get it installed properly with not enough racing for the sink. The ugly the worst then I said trying to put this thing in with a disposal in the way the sprayer in the way and the old faucet gave me the most trouble who is the oldest closet and trying to unscrew it to get it out. Rated 1 out of 5 by Linda from Will not shut off Our plumber sent us to his wholesaler to pick out a faucet. We paid a premium for it and it will not shut off. It was installed 2 1/2 years ago. 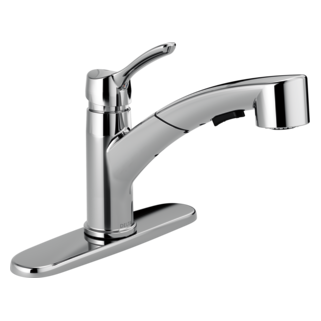 We never had any problem with the faucet that was in the house when we bought it but wanted to "upgrade". The handle has to be adjusted many times before it will shut off. Rated 4 out of 5 by Jackon2 from All things considered, a great tap so far. We are very pleased with this faucet, so far. (It was only installed two weeks' ago). 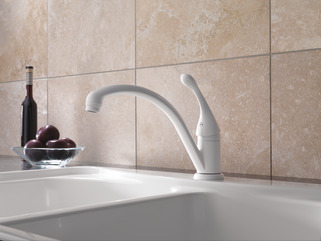 It isn't always easy to find a single-hole faucet, and this one fits the bill perfectly. Installation was quick and easy (10-15 minutes at most), and it looks great. I like that the faucet has a round plinth-like base, where it meets the sink, it's a nice detail. We are particularly pleased with the water flow rate; the sink fills in no time. 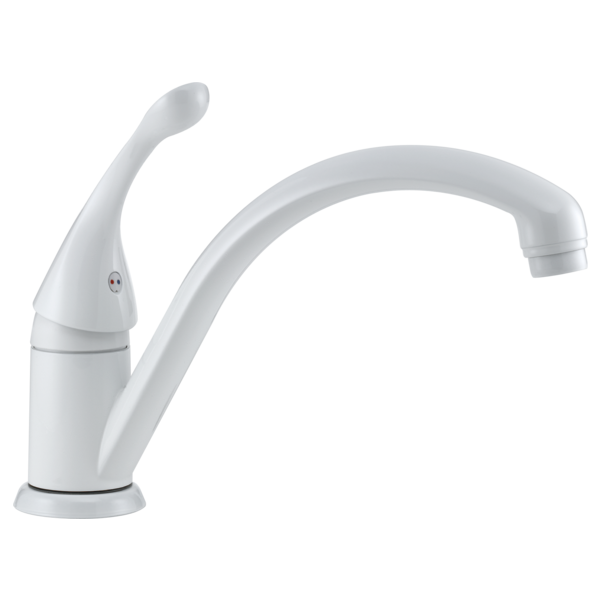 The spout swivels easily between our two sinks. My only quibble is the one-touch control; I haven't quite mastered the technique needed to deliver water at the temperature I want; like Goldilocks, I'm constantly adjusting between just a bit "too hot" and just a tad "too cold". It may just be a matter of getting used to it. What kind of aerator does this have? Can I put a diverter on it? How big is does hole in granite need to be cut for this faucet? Need more than 12 inch spout rich,single hole sink. Could ya just tell me how big of a home needs to be cut into granite? I'm not sure from diagram. Is it really as big as 58 mm? That doesn't seem right. 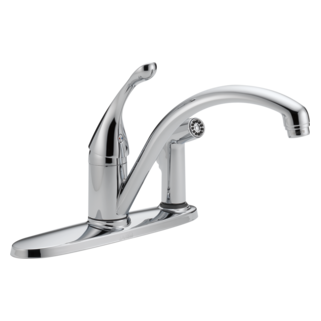 Does the Collins single handle faucet have a swing spout? Yes, the Collins single handle faucet has a swing spout. I love that it's tall enough to fit a spaghetti pot under and it moves completely out of the way so that I can fit just about anything into my sink! How high is the faucet and how far into the sink, length? It's 6 inches tall (not counting the handle). And from the base, out to where the water is dispensed, there's 9 inches. Gives you plenty of room to fit a spaghetti pot under but it's not so far out that it's awkward. PERFECT and definitely stylish.